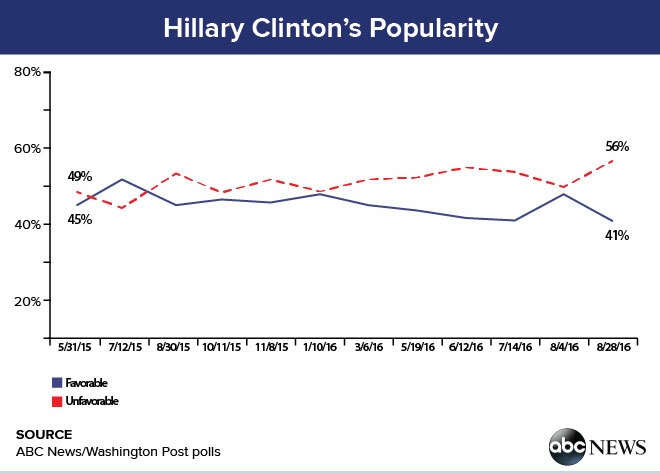 Hillary Clinton’s unpopularity reached a new high in the latest ABC News/Washington Post poll, putting her on par with Donald Trump among registered voters. The latest findings solidify their positions as the two most unpopular presidential candidates in polling dating back more than 30 years. Among all adults, 56 percent now view Clinton unfavorably, up 6 percentage points in three weeks, compared with 63 percent who say the same about Trump. Among registered voters, the two candidates have nearly identical unfavorable ratings: 59 percent for Clinton versus 60 percent for Trump. Before the 2016 election, George H.W. Bush had the highest unfavorable rating for any major-party candidate for president in ABC/Post polls, in July 1992, on his way to losing his re-election bid. Clinton’s rise in unpopularity follows renewed focus on her use of a private email server and alleged conflicts of interest regarding her connections to the Clinton Foundation while she served as secretary of state. This metric rose among some of her core support groups, including women, postgraduates, Hispanics and liberals. The change in recent weeks could be because Donald Trump has not made mistakes as serious as those he made around the time of the conventions, such as attacking a gold star family. By softening his language and avoiding negative statements which dominate the headlines, Trump has allowed the media to concentrate more on new revelations related to Clinton’s email and Foundation scandals. Trump’s trip to Mexico today will probably be seen as a positive, while Clinton gains no points in attacking Trump for the trip. Although Clinton has lost much of her bounce since the conventions, she still maintains a significant lead in many of the battleground state polls, and Trump is far behind in establishing a ground game. Posted in Donald Trump, George Bush, Hillary Clinton, Politics, Polls, Scandals. Tags: Donald Trump, George Bush, Hillary Clinton, Politics, Polls, Scandals. RSS feed for comments on this post.. TrackBack URL.